[138 Pages Report] Planting Equipment Market categorizes the Global Market by Type (Air Seeders, Seed Drills, Planters), Design (Automatic and Mechanical), Crop Type (Cereals & Grains, Oilseeds & Pulses, Fruits & Vegetables), and Region. 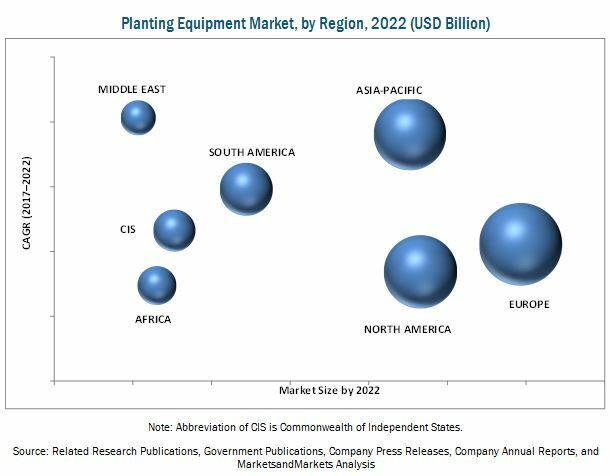 The planting equipment market is estimated at USD 15.82 Billion in 2017, and is projected to reach USD 21.43 Billion by 2022, at a CAGR of 6.27% during the forecast period. The objectives of the report are to define, segment, and estimate the global planting equipment market size, in both quantitative and qualitative terms. The market is segmented on the basis of type, design, crop type, and region. It aims to provide detailed information about the crucial factors influencing the growth of the market, strategical analysis of micromarkets, opportunities for stakeholders, details of the competitive landscape, and profiles of the key players with respect to their market share & competencies. The top-down and bottom-up approaches were used to arrive at the market size and obtain the market forecast. Data triangulation methods were used to perform market estimation and market forecasting for the entire segmentation listed in this report. Extensive secondary research was conducted through databases such as FAOSTAT and World Bank data to understand the market insights and trends, which was further validated through primary interviews. 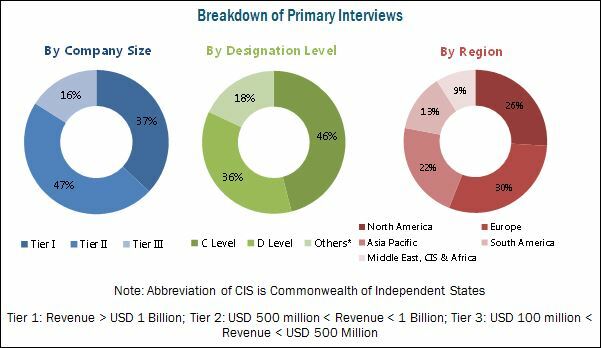 The report provides both qualitative and quantitative analysis of the planting equipment market, the competitive landscape, and the preferred development strategies of key players. The planting equipment market is dominated by various players, depending on their core competencies. The key players in this market are Deere & Company (U.S.), AGCO Corporation (U.S.), Buhler Industries, Inc. (Canada), Kinze Manufacturing, Inc. (U.S.), Case IH Agricultural Equipment, Inc. (U.S.), Bourgault Industries Ltd. (Canada), Seed Hawk Inc. (Canada), SeedMaster Manufacturing Ltd. (Canada), Morris Industries Ltd. (Canada), Stara S/A Indústria de Implementos Agrícolas’ (Brazil), Kasco Manufacturing Co., Inc. (U.S.), and Davimac Pty. Ltd. (Australia). This research report categorizes the planting equipment market based on the type, design, crop type, and region. With the given market data, MarketsandMarkets offers customizations according to client-specific needs. The planting equipment market is estimated at USD 15.82 Billion in 2017, and is projected to reach USD 21.43 Billion by 2022. The factors influencing the growth of the planting market are better and increased usage of mechanized equipment in farming over handheld equipment, reducing arable land for agriculture which leads to utilization of the available land for better yield, shortage of labor, and increased participation of corporates in the agriculture industry leading to increase in agreements for contract farming. The planting equipment market is segmented on the basis of type, design, crop type, and region. On the basis of type, the market is segmented into air seeders, seed drills, planters, and others (transplanters, broadcast seeders, and box drill seeders), among which the seed drills segment accounted for the largest market share in 2016. Seed drills are inexpensive and low in maintenance as compared to other types of seeders and planters. They are also compatible to small and medium sized farm land by acreage owing to which they are preferred. The planting equipment market, by design, is segmented into automatic and mechanical. The mechanical segment accounted for a larger market share in 2016. This is due to the affordability of the equipment that are mechanical in nature, and their greater suitability in small-to-mid ranged farm land, by acreage. The planting equipment market, by crop type, is segmented into cereals & grains, oilseeds & pulses, fruits & vegetables, and others (turf and turf grasses). The cereals & grains segment accounted for the largest market share in 2016, due to increase in the area under cultivation for cereals and grains across the globe and better agricultural practices adopted by the farmers which involves the usage of seed drills in planting the seeds. The European region accounted for the largest market share followed by the North American region in 2016. This is due to better adoption of mechanized farming as compared to other regions, access to better research and development facilities, and favorable foreign direct investment (FDI) policies in agriculture. The major restraining factors are less availability of bigger farm lands in the countries for large-scale fresh produce. The major restraining factor is less availability of consolidated agricultural lands for growing crops, which are required for contract farming; this restricts the usage of air seeders which generally requires large agricultural lands for planting of seeds. *Top 25 Companies Analyzed for This Study are – Deere & Company, AGCO Corporation, Buhler Industries Inc., Kinze Manufacturing, Inc., Case IH, Bourgault Industries Ltd., Seed Hawk Inc., Seedmaster Manufacturing Inc., Morris Industries Ltd., Stara S/A Indústria De Implementos Agrícolas, Earthway Products, Inc., Ndume Ltd., Southern Irrigation Chilliwack, Kasco Manufacturing Co, Inc., Lovol Heavy Industry Co. Ltd., National Agro Industries, Kheedut Agro Engineering Pvt. Ltd., Standen Engineering Ltd., Davimac, Great Plains Manufacturing, Inc., Landoll Corporation, Duncan Ag, Willsie Equipment Sales Inc., Truax Company, Inc., Monosem, Inc.
11.10 Stara S/A Industria De Implementos Agricolas. 11.11 Kasco Manufacturing Co., Inc.
*Details on Business Overview, Products Offered & Services Strategies, Key Insights, Recent Developments, MnM View Might Not Be Captured in Case of Unlisted Companies.